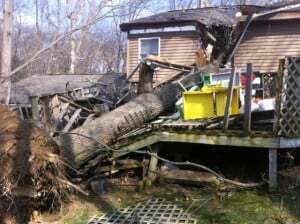 A standard home insurance policy will cover damage to your home if a tree falls on your house or a detached garage. This includes trees that fall because of wind, hail, ice, snow or sleet. Michigan is known for its beautiful, large trees. They can make any backyard come to life and any neighborhood feel enchanted. While they may be beautiful, they can also be rather dangerous. All too often, storm damage results in massive trees that have fallen through homeowners’ roofs. This is a dilemma that is not only inconvenient, but also dangerous. At Bloomfield Construction, we not only safely remove the tree, but provide the insurance repairs that will needed to repair your home. We harbor the necessary equipment to handle even the toughest of tree removal and damage situations. Our team is made up of highly trained specialists who understand the dynamics and latest solutions to home repairs. Leaving a tree that is protruding through your roof untouched is not only unpractical, but also unsafe. We function as an emergency service, so you can feel free to give us a call immediately after the damage occurs. We’ll also work directly with your insurance carrier to quickly get to a solution that works best for you – and your family. Our state, as aforementioned, is a scenic, tree-filled region. But, make sure that the trees don’t turn into a serious problem. Tree damage doesn’t have to ruin what you’ve learned to love about your home or your city. When you’re in need of tree removal and home repair services, call one of Southeast Michigan’s most-trusted contractors: Bloomfield Construction. Get A Damage Repair Estimate, Fast.